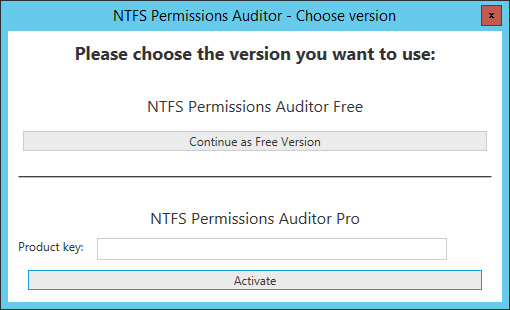 During the first launch of NTFS Permissions Auditor, you will be prompted to choose version - Free or Pro. If you have purchased Pro version license you can enter the product activation key and press Activate. Launch NTFS Permissions Auditor Free and go to Pro version tab. If product key is valid, you will see a confirmation message - NTFS Permissions Auditor Pro version has been successfully activated. If you have any problems with your product key, please don’t hesitate to contact us.